I was told that there were no rides available to take me from my home to the meeting but they could offer me a ride from my home to the Commercial-Broadway SkyTrain Station, which would allow me to take SkyTrain to within a block of the Translink meeting. I happily took this option and booked a pick-up for 9 to 9:30 a.m. MVT will not permit booking to be for a specific time but only for a half-hour window. For those of you who don’t use HandyDART, this means you must always book the ride with a large enough time frame prior to your appointment because you have to assume the bus may not get there till the end of the window. So I sat by the front window from 9 to 9:30 a.m. waiting for the ride, as required to do so — but no bus! The ride did not show up till 10 a.m.! By that time, I was not going to get to the TransLink meeting in time to speak, so I gave up. 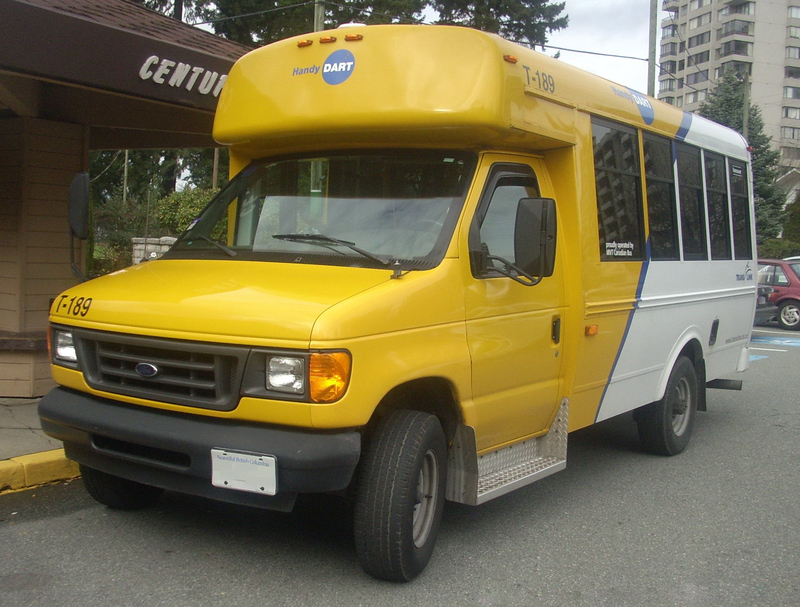 In the late 1970s I, together with a number of other folks, lobbied successfully to get TransLink’s predecessor, the Urban Transit Authority, to create HandyDART. We then lobbied for them to operate it in-house just like they do with conventional transit. But we lost that battle. TransLink insisted on putting HandyDART out to tender. So we set about with Plan B. We formed a user-run co-op, Pacific Transit Co-operative — the only co-op in all of North America made up of HandyDART users. We submitted a bid in 1981 (my first year at law school), and I still remember getting the phone call in early March telling me that we had won the bid! For 27 years PTC ran HandyDART, putting the HandyDART rider in the driver’s seat. We were an operator and a board of directors made up only of HandyDART users. We even hired a HandyDART user as our general manager. I’m sad to say that nothing good lasts forever. About 2008, Pacific Transit Co-operative lost the contract to an American-owned, for-profit company — the above-named MV Transportation. As a user-run co-op (a not-for-profit organization), we bid a fixed price to deliver a fixed amount of service. But if we ended up delivering that service for less, we would use the money left over to put more service on the road rather than giving it to shareholders. With a for-profit company like MVT, the profit is baked into the bid. It’s never put into raising service levels, but evaporates into pockets south of the border. MVT’s contract comes up for renewal next year. Why not the same for HandyDART as well? This entry was posted in accessibility, equality, HandyDART, social justice, Transit, TransLink, transportation, Vancouver. Bookmark the permalink.